As of lately South Ossetia and Abkhazia have nothing in common with Kosovo, they are similar to Northern Cyprus, and Turkey's decision to recognize Northern Cyprus as a nation of its own. Decades later, what Cyprus is going through is just pitiful. Russia calls for others to recognize South Ossetia and Abkhazia, and rallies countries like Cuba, Belarus and Venezuela. They even dared ask Turkey. I am sure there will be Syria there too, showing gratitude for recently purchased "defense" systems. I bet Syria will get some freebies for this recognition. Turkey is very unlikely to go along though. I have pretty bad record for predicting things, but I do not think Turks have given up their European aspirations, and their business in Georgia is way more than a hotel in Sokhumi. All of the anti-Russian talk aside, I pity Ossetians and Abkhaz who followed their leadership. Will they live better in Russia than they would in Georgia? I question that. Look at Chechens, they had aspirations and they were shot at. Neither South Ossetia, nor Abkhazia has been what would be called "independent" last 15-17 years. They were told what to do by Moscow, and that's what they did. Why? Because Moscow paid pensions and salaries in both statelets. Ossetia is a pasture land that survives on 60% Russian "donation" and the rest robbing people as they exit the tunnel. Lenght of Ossetia-Russia relationship's history can be easily summed up by the fact that Russians use a Georgian word to refer to the ethnic group. In Georgian, Ossetians are called "osi", "-eti" is added at the end to identify the place where people live/come from (e.g. Rusi/Ruseti, Turqi/Turqeti). Russians "conveniently" took Georgian Oseti, and by adding an -a, turned it into Ossetia and Ossetians became Ossetinets. Yet, they tout their "closeness" to each other. Georgia has lost the war, but future will see how happy Abkhaz and Ossetians will be "independent" and at the same time dependent on Russia. Can you please tell me why Kosovo and the South Ossetia and Abkhazian situations are not analogous? I keep hearing this, from sensible people who ought to know better, but I’m yet to hear anyone try to articulate an argument. The truth is their as close to identical as two things can be in the world. Second, to compare how the Chechans were treated by the Russians how the Ossetians and Abkhaz will probably be is silly. The Chechans fought the Russians, The Ossetians and Abkhaz fought with the Russians. Lot’s of nationalities live inside the Russian federation, and there is a wide gamut of how well they get along with the Russian government and with ethnic Russians. You just picked the absolute worst of them for your example. Oh, and by the way, if your wondering what’s in store for Tskhinvali, here is a NYT article that talks about it's reconstuction: Under Iron Hand of Russia’s Proxy, a Chechen Revival. Oops, I have another comment: the Russian word for an Ossetian isn't осетинец (osetinets) but rather осетин (osetin). About Grozny: I have yet to believe that that's what's in store for Ossetians. We will see that in a few years. Let's just wait. Russians have done a lot of Misha Bush's puppet cartoons, nothing new there. Their own decision, you say? In my world, independence and sovereignty means you make your own decisions about anything. If Moscow rebuilds Tskhinvali the way they rebuilt Grozny, that will be more and more "dependence" rather than "independence". Kokoity already announced today that he will pack his cabinet using russian ministers, so much for "Ossetia", if it is run by Russians. Kroka.ru is wrong. I've had this discussion before and have checked a friends Soviet "Dictionary of Nationalities" (yes such a thing existed). i am surprised you are giving me google count - try yandex.ru instead. are you questioning Griboedov too? Sorry, I should have said reasonable arguments. Those aren't reasonable. Actually their not really arguments at all, but a collection of emotionally chauvinistic appeals along with outright lies and careful omissions of truth. As you an imagine I don't have time to take the whole articles apart bit by bit (that would take about 50 pages) but PLEASE get a good non biased book on the subject. "Kosovo, which was legally part of Yugoslavia but not of Serbia was never manipulated..."
Wrong: Kosovo WAS a part of Serbia. Yugoslavia had only Slovenia, Croatia, Macedonia Bosnia and Herzegovina Montinegro and Serbia as constiuant republics. Serbia had two autonomous regions: Vojvodina and Kosovo. After a mistake like that, do I really need to take talk about this article further? RFERL is really just American propaganda (with all due respect) and you should know that. It's like an American Regnum. "Under the 1974 Yugoslav Constitution, Kosovo was granted the status of an autonomous province with virtually the same rights and responsibilities as the six Yugoslav republics, granting Kosovo an implied right of secession." Wrong: key words "virtually", "implied". I've read the Yugoslav constitution. It's just not true. Anyone can write stuff like this, that's not what I meant. I meant a real analysis with facts real anomalies, no lies. Why wouldn't you run the search on Yandex yourself before chalenging me to? With due respect to Griboedov, the correct form is осетин (maybe осетинец is an older form). i don't know why are you arguing about one form vs the other, the point is that both originated from georgian "oseti". and if people use both, both are correct. it's like miniscule and minuscule, some use one, others use another, in the end both are correct. show me an objective book and i will get it - come on, kosovars did not kick out 45+% of the population, as abkhaz did. I'm not arguing that the "oseti" is not the root for both. I'm not arguing at all. It was just a small technical correction :-). And as much as you like to correct me when I make a mistake, I like to do the same. And I do concede that people say osetinets. But it's considered wrong. People say armian (for singular nominative) and that's wrong too. But anyway, I repeat, I'm not contesting your central point about "oseti". I hope that my comments did not lead you to think otherwise. i personally have not heard "armian" myself - did you know that "chechen" is also wrong? (in russian, that is) and it's chechenets instead? But, but, but... THEY Albanians DID Ethnically cleans all the Serbs!!!! The Red Cross estimates that 250,000 Serbs and Others (groups that had tried to remain neutral) were ethnically cleansed right after the NATO bombing campaign. The capital is completely cleansed of Serbs now - Serbs remain just in a few pathetic villages in the north. ONe distinction which should be made about Chechnya is that the population itself never wanted to break away from Russia. In both South Ossetia and Abkhazia the populations voted for independence. The point made about many ethnic Georgians, who once lived in South Ossetia and Abkhazia, not being able to vote since they had left (been forced to leave) is a fair one. However, had Georgia not started conflicts with both regions post 1991 then those ethnic Georgians would probably still be there. The Russians had been urging the West to first hold international discussions to come-up with a framework for separatist regions BEFORE the West went ahead with Kosovo. As has been the case many many times, the West simply ignored Russian pleas for serious discussions on these complicated matters. Tim, I am not sure about this one, but was there Chechnya's independence actually put up to a vote? If not, I don't think that we can say "population itself never wanted". If vote was after Russians crushed the rebellion, that should not count either - it's comparable to asking people in Germany to vote for Hitler in 1939 and 1945. With Kosovo, Russia made it clear that it was not going to consider any option other than Kosovo is part of Serbia - so it's getting the same treatment from the West. What is ironic is Russia's preaching of "West's double standard" as it does exactly the same. Does this mean that Russia does not get to use that phrase any more? What Russia just did was a truly unilateral decision. NATO along with other countries supported Serbia operation, and Kosovo is in the heart of Europe - but Russia wants to use "my neighborhood - my business" approach to foreign policy, as long as it's not the Serbia/Kosovo issue. Regarding the Kosovo independence question (leaving aside the war), it's not true that Russia wasn't going to support any option for Kosovo other than being part of Serbia. What Russia said is that pretty much exactly what it said regarding Georgia up to the recent war: that we should Kosovo only with Serbia's permission. Serbia was willing to recognize the bulk of Kosovo's independence if it got to keep the North. If the slightest bit of pressure to be reasonable had been applied on Pristina, the Kosovars would have agreed (there is nothing there beside a few pathetic Serbs), but then it would have been then completely obvious that the NATO was carving up Serbia on an ethnic basis. So they had to keep the few remaining serbs in Kosovo. As you can imagine, this annoyed the Russians to no end, and then this completely idiotic claim that Kosovo was special annoyed Russia even more. The reality is that if you look at the big picture, Russia has been very patient and reasonable about this, but in the end it struck back. What is of course kind of sad is that Georgia had to suffer. I agree, there could have been a compromise solution to most of these regions which have wanted to secede. What would have been interesting in the case of South Ossetia would have been if both Russia and Georgia were to have enabled the central part of Ossetia (North and South) to form an independent state. The southern part of South Ossetia and the northern part of North Ossetia could have remains with Gerogia and Russia respectively. People could have then been given a choice of where they wanted to live- Russia, Georgia, or Ossetia. It is understandable that Georgians do not want to give up land. However, in the end it's probably better to give up a little, keep a little, and settle these disputes. Life if too short to be obsessed with such matters. IMHO, solution and both of you suggest sounds very good on the paper. Unfortunately, it is impossible in practice. So far, we have to see a relationship between Russia and another neighboring (including countries like Armenia, that don't have immediate border) country (small one - we are not talking about China) can be considered fair - Russia expects and demands treatment with respect, while does not give much back. It is not very likely that Georgians would go for that, and neither would Russians. Ossetians I am not sure about. "Meanwhile, officials in the Moscow-backed South Ossetian government have been quoted as saying Russia intends to absorb the breakaway province within "several years". Parliamentary speaker Znaur Gassiyev said the move had been agreed at high-level talks in Moscow earlier this week, the Associated Press reported. " of course this does not mean much yet, and shouting "russia is annexing south ossetia" won't do any good, but the fact is that russia will absorb south ossetia. if there is to be one ossetia, it will be inside russia, there is no other way. But i do not see one ossetia either - it's eathier to split things than put them together - kokoity will have to give up the reigns, south ossetia is what, tenth of the size of north ossetia? I think what you said about Russia not giving much back is really unfair. Your Armenian example is actually a perfect example of just how much Russia does give back. Basically, without Russia there wouldn't be one single Armenian alive in the whole world, and as an Armenian I think it would be pretty ungrateful of me not to respond without reminding you of this. And really, how many Uzbeks, Tadjiks, Kazakhs, etc. now have to live utterly destroyed lives thank to the fact that Russia is less involved in their lives. Where as before inside imperial Russian/USSR they had access to half the world, their options are pretty limited. 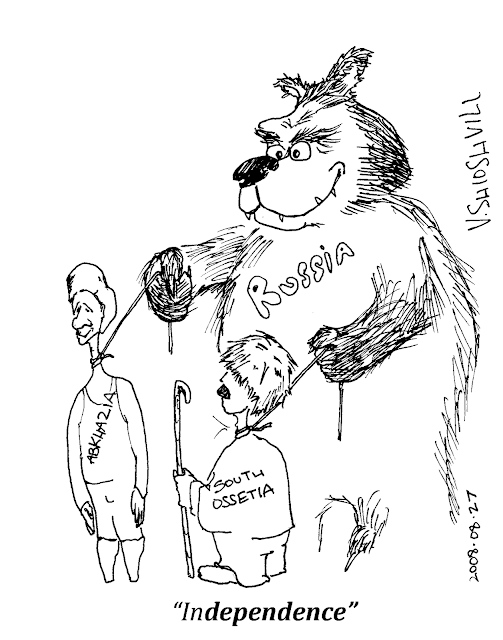 As for Russia "absorbing" South Ossetia, so what? Look Ossetians WANT to be part of Russia! Georgians just have to accept that there are people that like Russians and WANT to live in the Russian Federation. I don't understand why this is so difficult to understand for Georgians, when so many Georgians themselves choose to live in Russia. Anyway, a much better argument for this is the fact that all the people who disagreed with the Ossetians were ethnically cleansed. This is the tragedy. This is what makes what is happening so unfair. Timothy is writing: "ONe distinction which should be made about Chechnya is that the population itself never wanted to break away from Russia." Do you mean Chechen which are dead now didn't have time to vote or write down that they WANT INDEPENDENCE? Timothy is right. The Chechen "independence movement" was much like the South Ossetian independence movement. More about trafficing, banditry (and in the Chechen case, kidnapping) than anything than anything else. I never ask a lairs for an explanations. I feel the discussion here is a little bit besides the point and simply replicates the situation on the ground: we are repeating "historical facts" that can be cited as reasons for one or other side laying a claim or disputing a claim to a geographical region. Apart from getting into a discussion of much truth and objectivity is there in "objective truth", that is not going to help the situation one iota. For me, Lado wrote something in an earlier post that is much more true and valiant to say: the problem won't go away. Georgians, Russians, Abkhazians, Ossetians, Armenians, Azerbaijanis, Chechens, Ingushetians etc etc are going to be condemned for the foreseeable future to live, if not actually with each other, but at least side by side. Is Russia now evil or helpful in that process? Is the influence of, say, the Americans or the EU on Georgia benign or not? Eventually there are no "good" or "bad" motivations in conflict, or at least this classification does not help us a bit. There are conflicts over interests and over values, and we just have to accept them as such. Principles of international law? Forget it! As we have seen, anyone with the power to bend (or break) the law, will do so almost as they please. At the end of the day, the basic tenet about conflict transformation is that willingness to cooperate has to develop from the bottom up. And that is something that I believe the Georgian government was never really thinking enough about: what kind of incentives would the Ossetians be receptive to? How is it possible for Georgia to transform the situation on the ground (apart from the military build-up)? Saakashvili thought it is sufficient to table a peace plan of his own liking e.g. for Abkhazia and to stage a few pop concerts inside South Ossetia. That, obviously didn't work too well.